On the 24th of July, I went with the LST staff to the「Wasachi Festival」of the Gyon Festival. On this day, the deity who had been enshrined in the Shijo at the Otanisho on the 17th returns to the place of origin, to the Yasaka shrine. I was really impressed by all the people shouldering the Omikoshi (portable shrine), summoning up their strength and carrying it into the Maidono (court music pavilion in a Shinto shrine) of the Yasaka shrine. Moreover, it was the first time I saw a「divine’s departed soul coming back」. 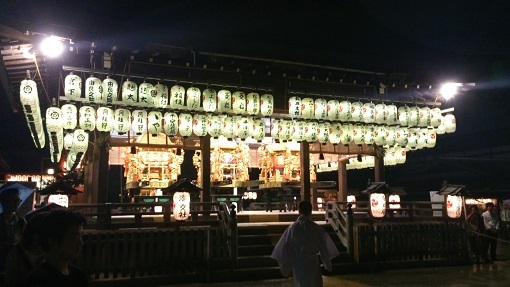 During the Shinto’s ritual, in which the deity was transfered from the Maidono to the main shrine, all the lights were put out. It was in the darkness and the silence that the ritual took place. Of course, photographs were forbidden and there were instructions to put on hold cellular phones. The mysterious atmosphere created by the presence of a Shinto priesthood, a white fabric which moved sometimes and the sound of a Koto (a 13-stringed Japanese zither) profoundly touched me. On the 31th, all the curtains of the Gyon Festival will close with the「Ekijinja Nagoshi Festival」. Each event happening during the Gyon Festival has a meaning. I am absolutely impressed by the fact that lots of people support and inherit this festival. As long as I live in Kyoto, I wish to come to see the Gyon Festival each year.